From Don Croft & Ken Adachi's "Goodbye Chemtrails, Hello Blue Skies!" on Educate-Yourself.org. The Wilhelm Reich Cloudbuster was well known for its ability to create rain. But a problem existed with its continued use, in that the deadly orgone energy that it absorbed could in fact hurt the operator if it was not correctly "drained off". This "draining off" of deadly orgone energy was accomplished by 1. Connecting the Cloudbuster to a body of running water (difficult) or 2. Connecting the Cloudbuster output to an orgone accumulator. However, the orgone accumulator would soon become saturated with the deadly orgone energy which in turn caused more problems for the operator. So the Cloudbuster, as good a technology as it is, has lain dormant for many years. By utilizing the research of Wilhelm Reich, we have created a cheap, portable and easy-to-build device that consistently destroys Chemtrails and heals the atmosphere. The “Chembuster” is the answer to these ongoing attacks. Unlike the original Cloudbuster, the CB changes the deadly orgone energy to good orgone energy and does NOT become saturated or dangerous to the operator. You can build one for about $150. Join The Battle - Now! It is human nature to sit on the sidelines and think that one person cannot change the things that are happening to our country. You now have no excuse for inaction. For a few dollars and a few hours of your time YOU can make a difference. 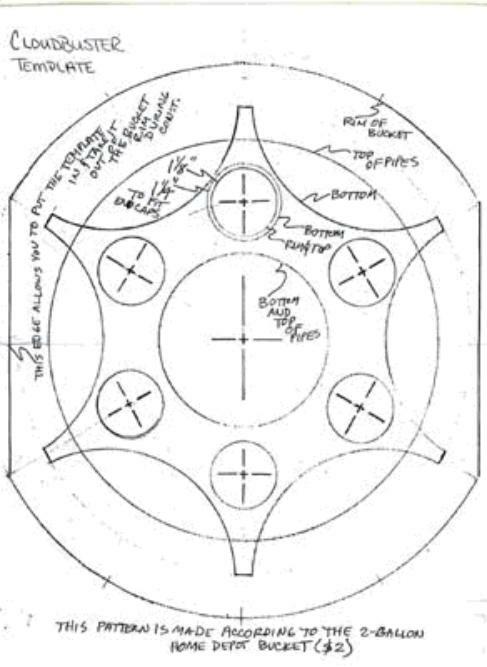 A properly constructed CB unit should be able to greatly reduce the effects of chemtrails for about 45 miles in all directions (90 mile diameter) from the unit. If used with Slim Spurling’s environmental tools, and a few extra crystals, the diameter can be increased to about 120 miles in all directions. With this device a mere few hundred concerned citizens can SHUT DOWN the multi-billion dollar chemtrail program. The Chembuster cannot do any damage. It can only help and heal. It’s up to you to join the fight to save America. BUCKET: Base: 9" in dia., 9" deep. I use two-gallon plastic buckets from the Home Depot paint department, but two-gallon food buckets, available from restaurants, or two-gallon spackle buckets from drywall contractors are fine. Leave the buckets on, as the handles make it easier to move the finished Chembuster. 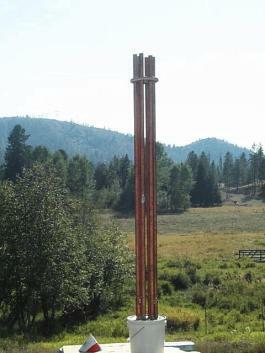 COPPER PIPES: Six standard Type M, 1" copper pipes, 6' long, open at one end, the capped ends submerged to within an inch or so of the bottom of the bucket before casting. For portability and shipping, you can use 12” sections of pipe in the base, adding five-foot lengths by putting couplers between the 12” and five-foot pieces. 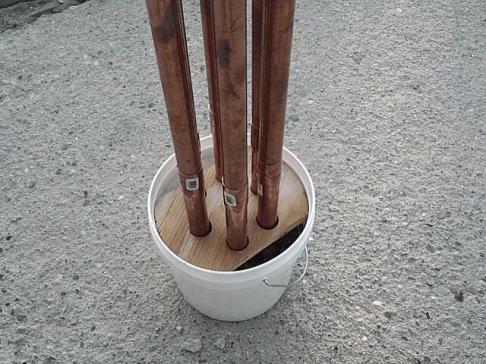 You won’t need to buy as much copper pipe this way, too. CRYSTALS: I glued a double-terminated (two pointed ends) quartz crystal, about 2" long, into a .75” section of garden hose, (or use electrical tape) then, glue to the inside of each of the six copper end caps, pointing in the same direction as the pipe will be after the cap is glued on. I use 'Goop' glue. Tape, or solder around the cap where it joins the pipe to prevent resin from leaking into the cap during casting. (Note) Another option is to add one citrine gemstone to each pipe before adding the crystal, this smoothes the CB’s energy and helps to transmute negative energies. However, citrine does not seem to make the CB any more effective at eliminating chemtrails. METAL PARTICLES: Get some metal particles from a machine shop, recycling yard or a place where they saw a lot of aluminum (sign shops and aluminum fabrication shops are good places to look). I use aluminum for weight considerations, but ANY metal will do. Very fine particles (such as filings from a key-making machine) aren’t quite as good as ones that will easily go through a ½” screen are okay. There really is a wide margin of suitability! PLYWOOD: Template 1 - 3/4” exterior plywood is used to make the base for the copper endcaps/pipes. I arrange the six pipes evenly around a 2 1/2” radius circle, which makes the pipes 2 1/2” apart on centers. A flat, 1 1/4” auger bit drills a suitable hole for each end cap. Template 2 - Make another piece to fit inside the rim of the bucket. Remember to cut a section away so you can fit your fingers under it to remove it from the bucket. This piece is not part of the finished CB, just used to get the spacing for the pipes right during construction. Cut the holes in this with a 1 1/8” flat bit so that it will fit well over the six pipes. This piece will hold the pipes in position while the second batch of resin hardens. Template 3 - I make a circular plywood spacer for the top ends of the pipes, 4” radius with 1 1/8” holes on the same 2 1/2” radius circles for the pipe ends. This keeps the pipes parallel with each other and fairly rigid. RESIN: I use polyester resin (used to build fiberglass boats), but epoxy also works, as does Envirotech resin from www.eti-usa.com (this sets up very quickly, so you need to be proficient with it). If you are going to construct many of these units, try to purchase your resin in 5 gallon buckets over the internet, possibly from a surfboard or boat manufacturing supply company. Home Depot gets $24 per gallon for resin. On a level surface, pour an inch or so of catalyzed resin into the bottom of the bucket and stir in metal particles until the surface is uniform and flat. CAUTION: Resin fumes are flammable; use in a warm, but well ventilated area. The ratio that seems to work is approx. one part resin to one part metal particles (equal volume of resin to metal particles). Put the base Template 1 onto that before it hardens, so that it just touches the surface and doesn't sink in much. Pour a half gallon of catalyzed resin into the bucket after the six pipes are set into the holes in the base template. Use the dowel to stir in handfuls of metal particles in the same ratio as before. Note that the wood Template 1 should not be pushed down to the bottom of the bucket with the resin squishing over the top. Carefully move the Template 2 down on to the six pipes until it is snugly within the rim of the bucket. Put the top Template 3 onto the top of the pipes and move them until the pipes are parallel. After the resin has hardened, remove the second template and set it aside. This is only used during construction, as I mentioned. You can finish off putting the resin/metal mixture in now in two stages if you want, up to within a half inch of the rim of the bucket. Now it’s finished (wait until it hardens before you move it. You will actually use about one gallon of metal shavings and 1 ½ gal. of resin. Cut six pipes, 12" long, and put the crystals/endcaps on them for the base. Buy six coupler joints which allow a pipe to come into them from both directions and stop at the middle. This allows you to make the rest of the pipe assembly from three pipes, 10' long, cut in half. The finished product leaves you with only one piece of pipe, four feet long leftover. Put the spacers (soldered if desired), then the 5' pipes onto the 12" base pipes, then put the third (top) plywood piece onto the 5’ copper pipes. The pipes will look skewed, most likely, so just twist the top plywood piece around until the pipes line up parallel. As you do that, the rim plywood piece will move around. You need to do this expeditiously, though not in a hurry, so that the resin doesn't harden before you're done. We experimented with 5' extensions to the pipes to increase the range. It had a strong effect on the moon and on the upper atmosphere of the planet for hundreds of miles. We also apparently shut down the weather warfare facility under Homestead Air Force Base by leaving the extended Chembuster pointing at the dead orgone field above it for a week. We found that we don't need to point it in any particular direction in order to clear the atmosphere of bad orgone, and the longer it's left standing, the nicer it feels for a longer distance from the Chembuster (many miles). We just stand it on its bottom, pointing straight up. We did once eliminate a belt of smog, which was just off the coast by aiming at it for a few minutes, so direction can be a factor. Chembusters destroy chemtrails consistently. It may take a few days for your Chembuster to activate the environment enough to do this, but after that point the spew will disappear within seconds of leaving the UN jets and dissipated trails that drift within range of the Chembuster will also disperse, but more slowly. The ones that are made up of solids take longer to dissipate, but we’ve found that these only make up about 10% or so of the spewing episodes. It also may help stop drought. Overall, it just balances the weather, I think it sort of mediates between the ground and the atmosphere somehow. The one in Namibia, Africa finally brought heavy rain to the desert there. It happened 9/5/01, and continued for several days. Gert, the fellow who made the Chembuster and reported the occurrence ( http://educate-yourself.org/africasfirstcloudbusterjun01.html ), told me that this had simply never happened in the Namib desert before to the best of anyone's knowledge. It's arguably the driest region on the planet. SUGGESTION: If you want even more rain, try putting water on top of the material in the bucket and/or hosing down the whole apparatus daily. In freezing climates, cover the top of the six pipes with mini umbrellas so water can’t freeze and shatter the crystals. The CB appears to effect chemtrails equally well whether it’s placed indoors or out. 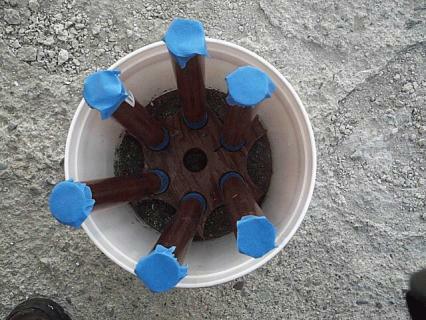 Up to seven crystals can be placed in each pipe to improve performance. The information and graphics on this site are released to the public domain for any non-commercial use. Please spread the word. Most of this document is unchanged from the original @ http://www.orgonite.info/how-to-make-chembusters.html.